The one beauty item I cannot live without? I love huge, look-at-me lashes, and am always on the hunt for that life-changing mascara. I went through a few duds last year (Too Faced's "Size Queen"--terrifyingly large brush), and this year too (Rimmel London's "Volume Accelerator"--was fine for a couple of weeks, then got really clumpy). 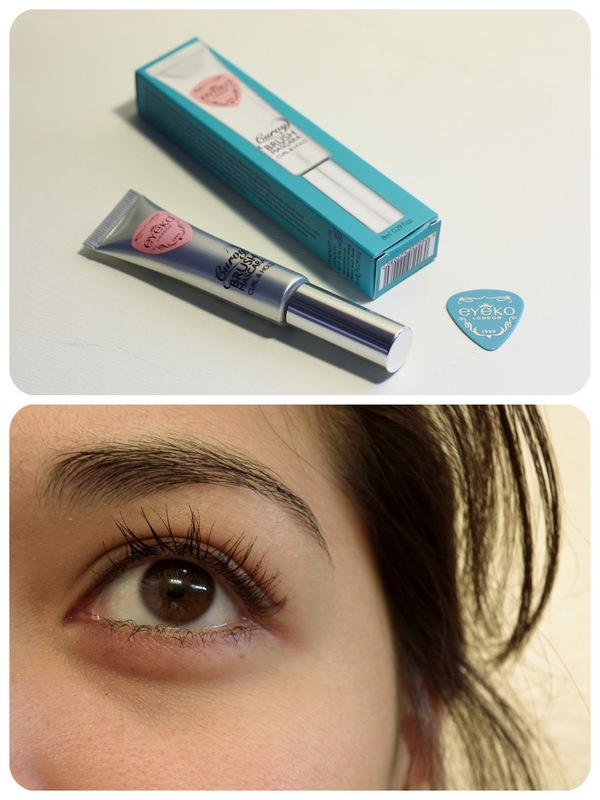 I recently received Eyeko London's Curvy Brush Mascara to try out, and was super excited. I bought a couple of lip products a few months ago from Eyeko on ASOS and loved them! Plus, I'd heard a lot of good things about their mascara. The packaging is great! I like that the mascara comes in a squeezy tube opposed to the typical hard casings--this means it'll be way easier to use it up (less wasteful!). The mascara also came with a guitar pick eye shield which seems more gimmicky than anything else. You're supposed to hold it behind your lashes while you coat them with mascara, but that seems unnecessary to me. Great formula. I love that it's kind of "inky" and smooth. Been using it for a few weeks and it never clumps. Not even on my bottom lashes. The brush separates well and coats lashes evenly. Lashes are long and flexible, but not comically so. Doesn't flake or rub off, but washes off easily. The mascara promises to "curl and hold", but it doesn't really do either very well. You definitely need to curl your lashes beforehand. It also doesn't seem to hold the curl the whole day, but works fine. Overall, it's a wonderful mascara. I'd like to try one that has more volume, but this one works very well and can produce doll-like lashes, especially if layered over a volume mascara (try layering over Benefit's "They're Real" mascara--I do this, and the result is pretty awesome). Eyeko's Curvy Brush Mascara is available for $19 USD inside all JCPenney Sephoras. You can also try Eyeko's Skinny Brush Mascara ($19 USD).